The best compact version of all things Uplift! We’ve combined our four signature formats into this 45-minute total body workout, a one-stop shop with the goal of increasing your strength, improving your stamina, and sculpting your core. Within four separate sections, you’ll focus on different exercises that challenge your body in different ways with dumbbells, resistance props, and your own bodyweight. Every exercise is timed and musically curated so you can push at your own pace and walk out feeling empowered. Women only, shoes required. Shoes Required. This 45-minute, low-impact, high-intensity strength training class combines compound strength circuits with low-impact cardio intervals. Focusing on your breath, balance, and flexibility, Sculpt is the perfect class if you're looking to increase your range of motion or supplement your training. NO shoes required. A 45-minute action-packed session, Power is focused on improving your body’s performance and muscular composition through the utilization of maximum impact in the minimum amount of time. This interval-driven class alternates between periods of explosive movement and active recovery/rest. Use your recovery periods to come back with even more effort and energy the next round. This class incorporates resistance bands, dumbbells, light props, and dynamic body weight exercises. Shoes Required. Incorporating dumbbells, resistance bands, and your own body, our 45-minute Strength class focuses on lifting the heaviest weights you can with the best form in a given amount of time. You’ll work each muscle group to fatigue before moving on to the next. At different points in class, you’ll burst into Tabata-style HIIT sessions to elevate your heart rate and leave you feeling exhilarated, accomplished, and strong. Shoes Required. A 45-minute non-stop workout including high-intensity cardio circuits followed by full-body resistance training circuits. The goal is to keep your body in motion, allowing your heart rate to elevate as high as it can. The results: Improved stamina and energy levels, higher cardiac output, better agility, and mobility. Endurance is appropriate for cardio enthusiasts, athletes, and anyone else. Shoes Required. A 45-minute action-packed session, focused on 20 minutes of high intensity interval training, alternating between periods of intense effort and complete rest, and 20 minutes of strength training circuits and core stabilization. The goal of Power is to push your body to it's limit using the best form possible. The results: improved metabolic function, improved athletic performance, and increased stamina. Power is appropriate for enthusiasts, athletes, pre/post natal women (with Coach supervision), and women over fifty (with Coach's recommendation). SHOES REQUIRED. The best compact version of all things Uplift! 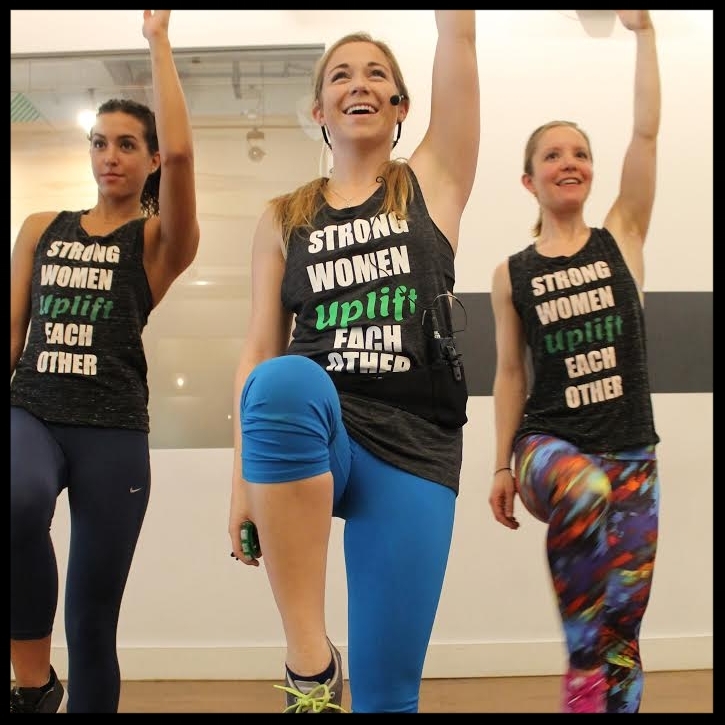 Uplift Express is a mash-up of all of our signature formats (Strength, Endurance, Power, and Sculpt). The goal is to work your body from head to toe by making the most of your effort in the most efficient amount of time. The results: overall improvement in every aspect of physical fitness. Uplift Express is appropriate for beginners, enthusiasts, athletes, pre/post natal clients women, women over fifty. SHOES REQUIRED. This 45-minute, low impact strength training format combines mobility sequences with low impact cardio intervals. The goal is to improve the body's balance and flexibility whie elevating your heart rate through full-body, low impact strength circuits. The results: better balance, posture, and flexibility, improved core stability and a decrease in common joint injuries. This signature format is appropriate for beginners, enthusiasts, cross-training athletes, pre/post natal women, women over fifty, and injured clients. NO SHOES REQUIRED. A 55-minute non-stop workout including 25 minutes of high intensity cardio circuits followed by 25 minutes of full-body resistance training circuits. The goal is to keep your body in motion, allowing your heart rate to elevate as high as it can. The results: Improved stamina and energy levels, higher cardiac output, better agility, and mobility. Endurance is appropriate for enthusiasts, athletes, and pre/post natal women (with Coach's supervision). SHOES REQUIRED. Strength is 55-minutes of time-based fatigue for every muscle group, interspersed with two tabata-style, high-intensity interval sections. The goal is to lift the heaviest weights you can using the best possible form in a given amount of time. The results: improved muscular endurance, better posture, better total body definition, better metabolic performance, increased interest in strength training. Strength is appropriate for beginners, enthusiasts, athleyes, pre/post natal women, women over fifty, and injured clients. SHOES REQUIRED. Copyright © 2018 Uplift Studios, All rights reserved.